The premise of this is simple. Do one thing per day for 100 days, change your life and pay it forward! Transgender Activist Dean Spade says one of the most compelling things we can do is to follow our authentic path and recognize that we have the power to influence change in all places. To help you recognize your spheres of agency, take the 100 day Diversity & Allyship challenge by applying a lesson a day from The Journey of Life: 100 Lessons from Around the World (top multicultural non-fiction book of 2008) to your life and paying it forward. Sign up by emailing sharonksobotta@gmail.com. 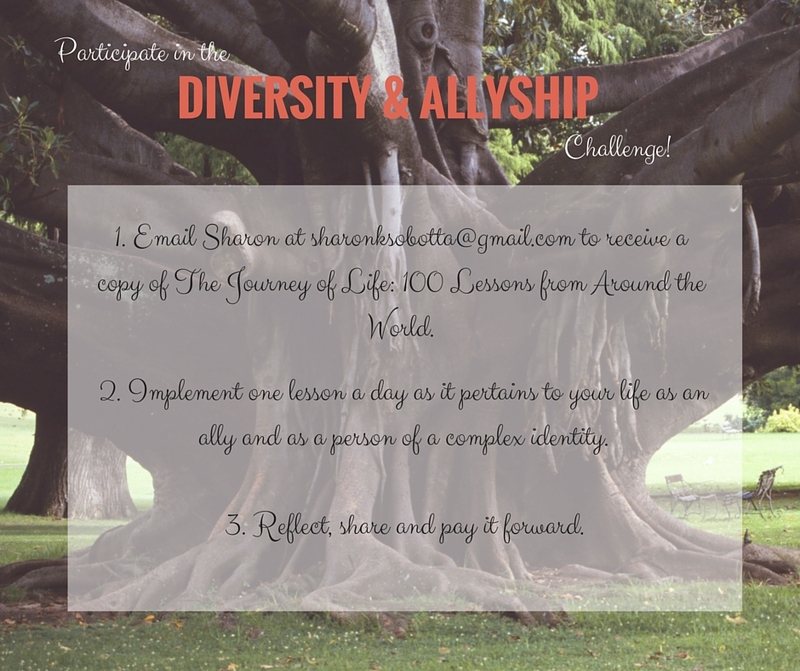 Participants in the Diversity & Allyship 100 day challenge will receive a copy of The Journey of Life: 100 Lessons from Around the World. Implement one lesson a day as it pertains to your life as an ally and as a person of a complex identity. Remember that part of fighting for a more just world and being an ally to others means, being an ally to yourself. Keep that in mind when implementing to the lessons. Reflect, share and pay it forward. There is power to speaking our truths. Take a moment to reflect on what you did to implement the lesson and what you gained from the experience. Then share (what feels safe and comfortable to share).